Before 1858 ,the old city of Allahabad had only two or three roads, and from these went a labyrinth of narrow streets that went to different parts of Allahabad with some having gates closed in the night. The British laid the railway line as the main strategic defense for the British Population cutting the city into two, creating a barrier between the Civil Lines to the north. The railway lines were laid out in 1858 immediately after the 1857 uprising. The civil lines were built on the confiscated land. It was all Pargana Chail (sometimes referred to as Pargana Ba Haveli ) with 8 villages that comprise the entire Civil Lines of today. The civil lines of today, is created out of those destroyed eight villages, owned and managed primarily by Muslim landlords. All the 8 villages were destroyed; population was hanged, shot or driven away. The remaining population ran away and the villages were remodeled & replaced with paved streets set out on a grid pattern and lined with trees. One of the old village was Rasoolpur populated by Mewatis , they were asked to choose another place in Allahabad and leave the original one. Eventually they moved towards north east and chose a place for their abode and named it “Rasoolpur” again to have the same name. Rasoolpur locality in Allahabad is the same displaced Rasoolpur. The plots for bungalows were as large as 10 acres. The civil lines was only for the European society, Government offices, clubs, polo field , church etc and the social life revolved around visiting ganges, playing polo, clubs, sport events, drinking parties, all modeled in the upper class behavior with an European stamp on each of them. 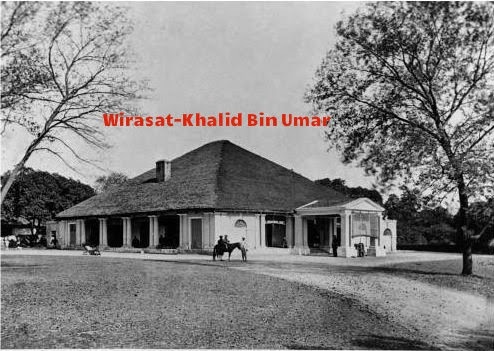 (1) The Anglo Indian population Or Eurasians – settled near the railway station. 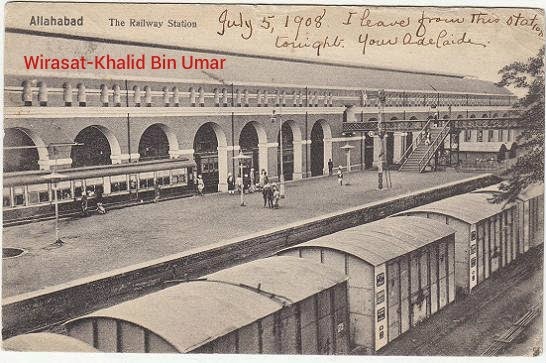 The Anglo Indians were generally considered an embarrassment to the British but a place was created for them in the jobs in Railway so that their loyalty could be tested and trusted. All these places, Civil Lines, Cantonment, Railway Colony and Bengali Settlement were places of defined and limited interaction between races. Europeans lived in the areas intended from them only while the others had limited interaction. A photograph of an old Bungalow next to the church taken in 1866 is shown above with another one showing the Railway Station n 1908. Thanks for the wonderful information ..
was anawre of it as a bengali Allahabadi. .. Thanks for sharing the knowledge with us! Interesting Khalid Bhai , I was known made by British and prohibited for Indian for long time but not aware about the fact it was done distraction of 8 village .